What Can I Learn in an Online Master’s in English Program? What Can I Do With a Master’s in English Degree? How Much Can I Make with a Career in English? During a master’s in English online, students may specialize in literature, rhetoric and composition, or teaching English. After completing their degree, graduates can work as writers and authors, editors, or educators, applying skills gained during their master’s program in the professional workforce. A graduate degree prepares professionals for advanced positions in their field, such as managing editor or senior technical writer, and increases their salary potential. An online degree in English can help students take the first step towards entering a career that allows them to apply their passion for grammar, literature and other areas of focus within the field. An online learning program also gives students the opportunity to pursue their degree while maintaining other time commitments such as work or family matters. With so many schools offering online English programs, it can be hard to know which school is “best”. To help with this, we’ve ranked schools across the country based on factors such as cost, institutional financial aid, and graduation rates. Discover which schools made the cut below. Currently certified English teachers or students interested in pursuing teaching certification in English can earn their master's online at New England College. The Master of Education online degree program offers an English concentration, which can be completed in 1-2 years. The program follows the New Hampshire State Certification Standards for teachers. Online graduate students at NEC can apply for financial aid through federal, state, institutional and private loans. Military students and their families can apply previous coursework and training towards their degree and receive discounts and other financial assistance. Northern Arizona University offers 3 different online master's degree programs in English. Students can enroll in a Master of Arts in English - Literature, Master of Arts in English - Professional Writing or Master of Arts in English - Rhetoric, Writing and Digital Media Studies. Graduates can pursue careers in the fields of curriculum development, publishing and educational research. NAU's online programs are offered in 2 formats: self-paced, with weekly start dates that allow students to complete classes within a 6-month subscription; or structured-and-guided, with set start dates and a faculty mentor to assist with asynchronous or scheduled class time learning. The University of Texas of the Permian Basin offers a 2-year online graduate degree in English for students interested in pursuing academic research in the field, or entering careers in the fields of education, law, public relations and publishing. The Master of Arts in English online degree program prepares students to enter PhD. programs. Current high school teachers interested in teaching advanced or college-credit courses can also enroll in this program. Online students can apply for federal, state, institutional and private financial aid to help pay for their degree at UTPB. Students interested in teaching high school and college courses in English can earn their master's in English in an entirely online format at Heritage University. The Master of Arts in English program also prepares students to pursue their doctoral degree in English literature, composition theory or linguistics. Courses are asynchronous and available in an online or hybrid format. Graduates from Heritage's English master's program can work as teachers, journalists, editors or communications managers. The college offers financial aid to online students, including federal, state and private aid. Morehead State University offers an online or hybrid master's in English degree with thesis and non-thesis options that are self-paced. Graduates from the online Master of Arts in English program can pursue careers in teaching, law, public relations or publishing. MSU online students pay the same tuition as in-state students and can access financial aid resources. The college's English department offers a range of scholarships. Online students can utilize MSU's Career Services to help prepare them for interviews, applications and resume writing, and internship placement. 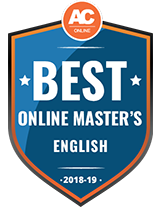 There are 3 specialized degree tracks available for prospective students in Bowling Green State University's online master's in English program. The Master of Arts in English online degree is designed to prepare graduates for teaching, writing, editing or publishing careers. Students can pursue a general Master of Arts in English degree, a master's in English with a specialization in teaching or a master's of English in professional writing and rhetoric. Courses are asynchronous to suit an individual student's schedule, and BGSU offers financial aid opportunities for online graduate students. Students can earn their master's in English degree at Ohio University through an online format in as few as 16 months. This program starts in May and courses run for 7 weeks. The program doesn't require applicants to take the GRE. Students can apply previous credit toward this degree as well. The Online English Master of Arts for Teachers degree program is designed to prepare secondary teachers to teach college-level English courses, either in their home state or through Ohio's College Credit Plus program. Texas Tech University offers the opportunity for students earning their master's in English to develop a specialized thesis as an online student. The Master of Arts in English degree program also allows students to choose a broader course of study in English if they are interested in teaching high school, or to focus in an area of study for a future doctoral degree, or to prepare for a career in the literary world as a publisher or writer. Online students can choose to engage in TTU's Professional Development Curriculum, which prepares students for a future career. The University of Texas at Tyler provides an online or hybrid master's in English degree to students who have taken the GRE or have earned a recent master's degree in a field related to English. Applicants must have proficiency in a foreign language as well. Students in the program can choose to pursue a thesis track or non-thesis track. The Master of Arts degree in English program at UT Tyler prepares students to teach at community colleges, among other possible careers. Graduate students in the online program are eligible for financial aid. Students with an undergraduate degree can earn a master's degree in English through an entirely online program offered by the University of Nebraska at Kearney. The program offers an emphasis in writing, and can serve as professional development for current teachers or professionals. Students interested in pursuing an advanced degree in writing may enroll as well, though the online Master of Arts in English degree program does not offer a thesis option. UNK provides financial aid resources for online students, as well as library services and career resources. While earning a master’s in English online, graduate students build core skills in literary analysis, rhetoric and composition, and literary theory. Most programs offer several different specializations, including British or American literature, technical writing, and teaching writing and literature. In any concentration, master’s students gain writing and research skills that benefit professionals in many fields. Earning a master’s degree in English typically requires between 30-36 credits of coursework, which may include a master’s thesis or examination. Full-time students can complete the degree in two years, while part-time students may require additional time. Some programs may offer an accelerated option for students to complete their degree in less time. Online programs provide a flexible schedule for graduate students, allowing some students to continue working while completing their degree. What common courses are offered in a master’s in English program? Graduate programs in English offer a variety of courses, depending on the graduate student’s specialization. The courses listed below cover some of the most frequently offered classes in a master’s in English online program regardless of specialization. Classes on literary theory introduce graduate students to theoretical approaches to literature. The course may focus on a particular field, such as romanticism or modernism, or a particular theory such as new historicism, gender analysis, or postmodernism. Graduate students read prominent literary theories and analyze their works, and the course may require a research paper comparing multiple theories. Graduate students study the theory behind teaching writing and the practice of teaching. The course may introduce different methods of teaching writing, principles of teaching, and the history of teaching writing. Students may build tools and course materials to teach writing at the secondary or post-secondary level. Classes on rhetoric and composition cover the histories of composition and literature, critical assessments of teaching English, and writing instruction. Graduate students may also study topics such as writing assessment, literary analysis, research methods, and important works in composition studies. Seminars in literature focus on a particular field within literary studies, such as 19th century literature, medieval and Renaissance literature, or postmodern literature. Graduate students read important works from the time period and critically appraise them. A world literature course introduces graduate students to national literature from non-Western countries. The course may focus on a theme, such as colonialism or cultural identity, or it may focus on a single country. Graduate students read novels, plays, poetry, and other works of literature, and the course often culminates in a research paper. 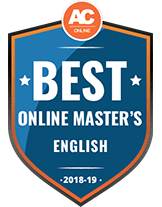 During a master’s in English online, graduate students complete research papers, literature reviews, and analytical papers as part of their coursework. Most programs also include a final master’s thesis or master’s examination in order to graduate. During a master’s thesis, graduate students work under a faculty adviser to conduct research and apply theoretical framework to an original argument. Master’s students then defend the thesis before a faculty committee. Alternatively, students may take a master’s examination covering their research areas; the exam may be written or oral, depending on the program. What specializations are available in a master’s in English program? Within a master’s program, English graduate students may focus on one of several areas, including literature, rhetoric and composition, technical or professional writing, or teaching English. Concentrations allow students to build advanced skills in their subfield, preparing them for specialized careers after graduation. Each program’s specializations vary, so prospective students need to research the options before applying. With a literature specialization, graduate students focus on the literary works of a particular time and place, such as colonial American literature, medieval literature, or 20th century British literature. Students read works produced in their focus area and secondary source interpretations of those works, including literary theories. A rhetoric and composition specialization emphasizes the theory and practice of writing. Graduate students may complete courses in semiotics, methodologies, and language. They may also explore the evolution of rhetoric and rhetorical theory, rhetoric in different contexts, and research methods. A concentration in English teaching prepares graduates to work a secondary school English or language arts teachers. Graduate students take classes in language, literature, composition, and writing, with an emphasis on teaching these skills. The classes cover the theory and practice of teaching English. Some programs may require that incoming students hold a current teaching license. With a master’s degree in English, professionals work in a variety of fields, including writing, publishing, and education. The degree prepares graduates to work as writers, editors, or technical writers, or to work in education as a secondary school teacher or a postsecondary instructor. In many of these fields, a master’s degree qualifies candidates for advanced positions, such as senior writer or executive editor. Some positions may require additional certification or licensure. Below are a few prospective careers for students with a master’s in English. Writers create written content for books, magazines, advertisements, and websites. They may write fiction or nonfiction, conduct research to support their writing, or write copy for advertisements. Most writers work with an editor or client to create a finished piece, but many are self-employed or complete work on a freelance basis. Editors develop story ideas, review written content, and revise pieces for publication, editing fiction or nonfiction in the form of articles, books, or advertising copy. Revision of unclear text, verification of factual information, and evaluating pieces to decide what to publish constitute some of an editor’s daily tasks. Managing editors and executive editors oversee an editorial staff, making decisions about daily operations, hiring, and running a publication, public relations firm, advertising agency, or broadcast. Technical writers communicate complex technical information to customers and users in clear and concise language. They work with engineers, product designers, and developers to understand a product or service, create how-to guides or instruction manuals, and communicate technical information internally for their company. Technical writers may also work with users to improve and revise content. High school teachers educate adolescents, providing academic lessons and assessing student strengths and weaknesses. Teachers create lesson plans, grade assignments and exams, and communicate with parents. Most positions require at least a bachelor’s degree to qualify for a state teaching license; a master’s degree in English may also meet the licensure requirements. Teachers with a degree in English may teach language arts, literature, or drama. English professors design courses for post-secondary students attending two-year or four-year institutions. They create syllabi, compose lectures, teach courses, and grade student work. Professors may also conduct independent research and publish their work in academic journals. A master’s degree in English meets the minimum qualification to teach at many community colleges, and graduates may also serve as instructors at four-year colleges and universities. Professional organizations help English graduate students build a network of fellow students and working professionals while earning their degree. Many organizations offer annual conferences, publications, and programs to support students and early-career professionals. By researching professional organizations, graduate students can ease the transition from school to the workforce. An organization of independent nonfiction writers, ASJA offers professional development resources such as mentoring, market information, and meetings with editors. The society also hosts seminars and workshops. An association of English teachers, NCTE offers professional development resources, lesson plans, and teaching strategies. The council also hosts events, provides web seminars, and offers a career center. Dating back to 1883, MLA advocates for English, literature, and foreign language teachers. The association offers an annual convention for networking and professional development, publishes research, and provides career resources. STC represents technical writers and others in the field of technical communications. The society publishes research, hosts an annual conference, and offers a certified professional technical communicator program. A professional organization for writers, the Authors Guild offers advice on copyright protection, reviews writer contracts, and provides legal assistance. Member benefits include a reference guide for contracts, regional chapters, and events. After earning a master’s in English online, graduates pursue careers as writers, editors, and educators. The chart below shows the salary range for some of the most common career paths, including the lowest, median, and highest salaries in the field. While a master’s degree does not guarantee eligibility for every position, the degree can help professionals advance their careers in any of these areas. Many career paths with an English master’s degree show potential growth over the next ten years, according to the Bureau of Labor Statistics. For example, both writers and high school teachers may see an increase in the number of job openings of 8% by 2026, with technical writers in even higher demand, with a projected increase of 11%. These growing fields offer opportunities for career advancement for candidates with a graduate degree. Salaries in every field vary depending on the individual’s degree level. As students earn advanced degrees, their salaries typically increase. According to a report by the Center on Education and the Workforce, professionals with a bachelor’s degree in English earn a median annual salary of $53,000. With a graduate degree in English, professionals earn a higher median salary of $68,000, an increase of $15,000 a year. The accreditation process reviews colleges and universities to determine whether they meet standards for academic excellence. Schools voluntarily undergo accreditation review from nonprofit accrediting agencies. During the review, the accrediting agency measures a university’s student learning outcomes, checks its faculty qualifications, and assesses the graduation requirements for every degree. Only universities that pass the review receive accreditation, and schools must undergo a periodic review to maintain their accredited status. When choosing an online master’s in English program, prospective students should only apply to programs that hold regional accreditation. The most prestigious standard, regional accreditation meets the federal guidelines to qualify for financial aid. Students with an accredited degree often qualify for more certifications and licenses. Some states, for example, only grant teaching licenses to candidates with an accredited degree. Many graduate students earning a master’s in English online pay for their degree by applying for financial aid. Some students can fund their degree with savings or by working while in school, while others rely on a mix of loans, scholarships, fellowships, and grants. Online graduate students qualify for federal financial aid, which offers loans, grants, and work study. Applicants fill out the FAFSA, or Free Application for Federal Student Aid, providing information about their graduate program and finances, in order to receive a financial aid package. Federal financial aid must be repaid after graduation. Many English programs offer graduate funding in the form of fellowships or scholarships. Graduate students may need to apply for funding with a separate application requiring additional essays or letters of recommendation. Offered by the Intercollegiate Studies Institute, the graduate fellowship offers up to 15 awards between $5,000 and $15,000 to support graduate students who plan to go into teaching. Applicants must submit an essay, a CV or resume, an autobiography, an academic writing sample, two letters of recommendation, and unofficial transcripts. The federal financial aid office offers the TEACH grant program for students earning a degree who plan to teach in a high-needs field in a low-income area. Graduate students can receive up to $4,000 a year, and recipients must then teach for four years in the eight years after graduating to meet the eligibility requirements.